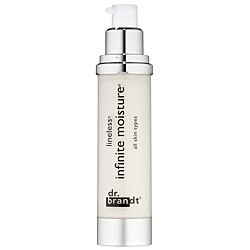 Dr Brandt Lineless Infinite Moisture is an intense hydrating lotion. This energising formula promotes a healthy appearance and protects the skin against free radicals. It keeps skin hydrated and supple all day long whilst it energises and promotes a healthy appearance. Water (aqua), c12-15 alkyl ethylhexanoate, glyceryl polymethacrylate, butylene glycol, ahnfeltia concinna extract, sericin, glycerin, caprylic/capric triglyceride, cetyl phosphate, paullinia cupana seed extract, cola acuminata seed extract, ilex paraguariensis leaf extract, tocopheryl acetate, sorbitan stearate, phenyl trimethicone, sodium hyaluronate, propylene glycol, palmitoyl oligopeptide, peg-8, geranium maculatum oil, cananga odorata, flower oil, triethanolamine, carbomer, methylparaben, ethylparaben, propylparaben, isobutylparaben, butylparaben, phenoxyethanol, tetrasodium EDTA.